Out PASA certified Kiteboard instruction program leverages the use of a mobile boating platform to give you the greatest chance of finding the wind on any given day. A 3-Hour Kiteboard Class is $385 and you can add and additional person to the lesson for $150. Bring along a non-kiteboarding friend for and additional $50. So you've decided you are committed to learn kiteboarding then this 2 day kitesurfing lesson will help get you on the water fast. Your best chance for retaining the information and advancing your skills is to follow up your first day with second day of on the water kiteboarding. Our two day program gives the opportunity to maintain your learning momentum and bring the board and kite skills together. After geting the basics on day one the second day of kiteboard instruction will cover waterstarts, board recovery, body-dragging, board retrieval, and the skills you need to become to a self-sufficient kiteboarder. All the gear you need is included in the lesson rates. Two 3-Hour Sessions (2 Day Course) 0 and you can add another person to the lesson for an 0. Add a non-kiteboarder to ride along for 0. Learning the basics is great but if you've decided that you want to really expedite the learning curve and get your kiteboarding game on ASAP then without doubt the 4 day program is the ticket. This program starts out with the same curriculum of our 2 day session but adds on 2 days of lessons tailored to your individual needs. The goal is to get you proficient and confident to head out on your own. 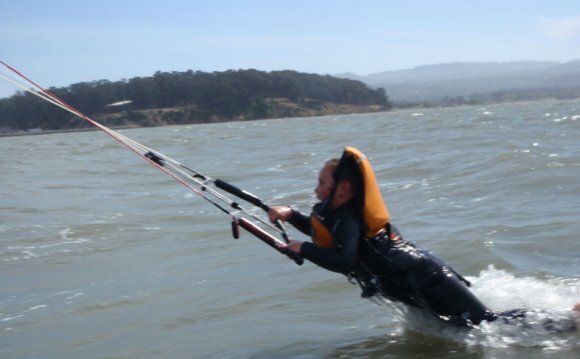 Specialized skills like upwind riding are coveresd along with getting prepared for many of the various scenarios you may encounter on the water. . Along your journey, you encounter different wind/water conditions and new situations that challenge your abilities and enhance your awareness. All the gear you need is included in the lesson rates. Four 3-Hour Sessions are $1450 and you can add another person to the lesson program for an additional $600. 3-4 hour Crossing $400 and you can add an additional riders for $150 each. 3-4 hour Adventure $400 and you can add an additional rider for $150. Additional hours can be added for $100 each. Bring a non-kiting person on the boat for an additional $100. 3 hours of custom kiteboarding instruction $385. Add another person to the lesson for an additional $150.